Two people were killed and another was critically injured Wednesday morning after the car they were riding in crashed into an apartment building in Diamond Bar. 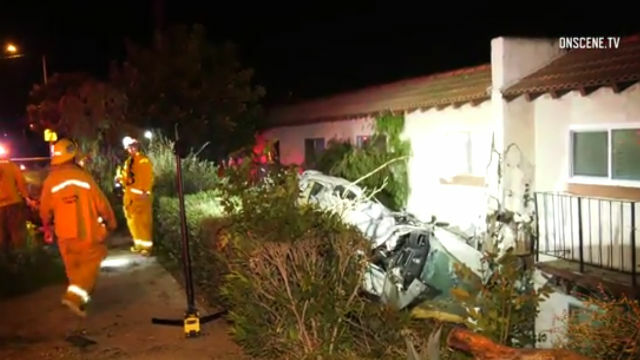 Sheriff’s deputies responded about 11:40 p.m. Tuesday to the 23600 block of Golden Springs Drive and located a BMW that had crashed into an apartment building, according to Deputy Tracy Koerner of the Los Angeles Sheriff’s Department. Investigators determined the driver of the BMW was traveling at a high rate of speed and missed a curve, jumped the curb, plowed through some bushes and crashed into the building, Koerner said. Two people in the car were pronounced dead at the scene just after midnight and the third was transported to a hospital in critical condition, he said. Diamond Bar city building inspectors yellow-tagged three units, meaning residents could retrieve items from inside, but could not reside there, said Koerner.